A billion-dollar industry, fashion accessories offer a world of business possibilities for stylish entrepreneurs like you! 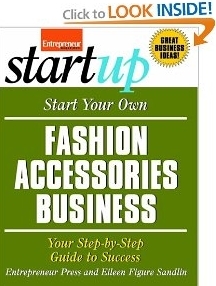 From jewelry and handbags to scarves and hats, this book covers the hottest accessories businesses within the flourishing fashion industry. Learn how to create and sell your own accessories, buy wholesale accessories for resale, or establish your own online or traditional store! Learn how to create and sell your own accessories, buy wholesale accessories for resale, or establish your own online or traditional store! Providing insider advice, tips, and tricks along the way, our expert fashionistas take you step-by-step and show you how to discover your specialty, establish your business, set up your home workshop and office, manage your finances, and much more! Click here to learn how to turn your passion for fashion into a successful business today!